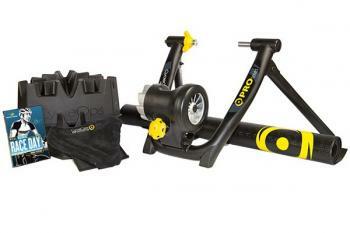 The exact same turbo trainer as the CycleOps JetFluid Pro that comes with an additional 2 x front wheel climbing blocks, a trainer mat, a bike thong, and a RealRides Race Day DVD. The CycleOps JetFluid Pro Trainer uses a specially engineered fluid resistance brake that offers road-realistic progressive resistance, and the harder you pedal the more resistance is offered. The JetFluid Pro uses CycleOps’ PowerTuned Technology, which fits a power curve that mimics what you would encounter when cycling on the open road. 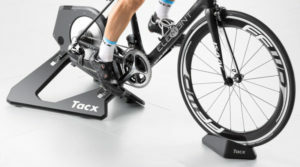 For this reason this is a great turbo trainer for serious cyclists who want an as realistic as possible experience from their indoor workouts. This is also one of the quietest turbo trainers you will find on the market. 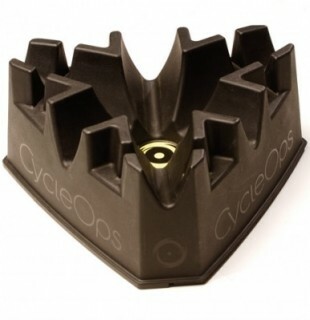 More details can be found on the CycleOps JetFluid Pro product page. The climbing blocks increase the realism of your workout, as well as offering varying riding positions to represent more of an uphill incline that will get you out of your saddle. As is standard with turbo trainers your back wheel is set to a higher position to raise it off the ground, and therefore most users purchase a riser (or climbing) front wheel block to create a more horizontal and road-realistic riding position. With this Training Kit package you get 2 front wheel climbing blocks so you can ride in a horizontal or an inclined position. 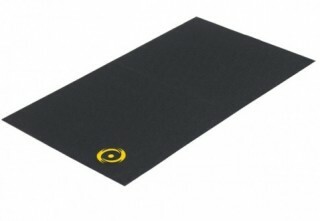 You also get a training mat as part of this package, which reduces vibration noises and also protects you floor from wear as you workout. It also stops sweat dripping on your floor. On this subject, the included bike thong is there to catch sweat, because working out indoors on turbo trainers causes you to sweat considerably more than riding outdoors. Users of turbo trainers also consider these sweat thongs essential as getting sweat all over your bike and floor is not desirable. Finally, included in this combined trainer pack is a RealRides Race Day DVD that includes special training programs specifically set to increase power and endurance. This is a great total package for anyone looking to get a home turbo trainer so that they can use their road bike indoors, and comes with one of the most realistic and quiet trainers currently available.